The RACE show at Jerash, Jordan, is a must if you have the opportunity to visit the area. RACE stands for Roman Army and Chariot Experience. 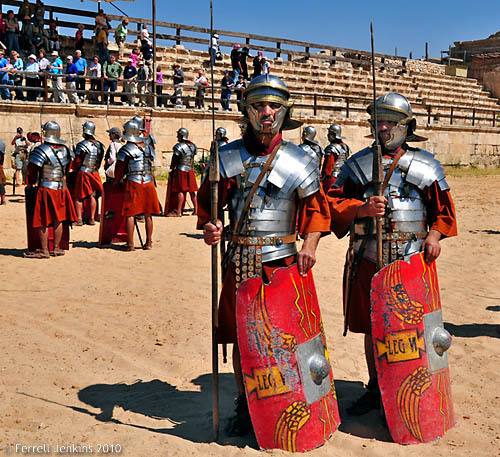 You will see actors in authentic dress as armed legionaries, gladiators, and a short chariot race. The show takes place in the Roman hippodrome of Jerash. The view of the city ruins in the vicinity make this a wonderful setting for the performance. Full details may be found here. I have seen the program three times. On the last visit, earlier this year, I thought the performers showed less discipline and the show was not quite as good as on my previous visits. Roman soldiers at Jerash, Jordan. Photo by Ferrell Jenkins. Repeat from October 8, 2010. This entry was posted in Archaeology, Bible Lands, Bible Places, Bible Study, Jordan, New Testament, Photography, Travel and tagged Ministry of Jesus, Roman Empire. Bookmark the permalink.